Pretty much everyone – including your kids and grandkids – loves binoculars. A pair of kids binoculars may cost more than you’re willing to spend though. A cheap pair of binoculars is just that. Chances are that they’ll break before they get much use. Fortunately, you and your children can have fun together crafting your own personalized pair from empty toilet paper rolls. The costs are minimal, perhaps even zero, if you already have all of the materials. Below are 6 possibilities for kids binoculars each based on a special theme – Christmas (Santa), St. Patrick’s Day (Leprechaun), clouds, the zoo (zebra), sharks, and birds. If you’re interested in one particular theme, you can click on it in the table below. Otherwise just keep looking through the list to see which ones you like best. If any of the owners of the site from which I got the pictures below would rather not have them posted here, please let me know. I will remove them as soon as possible. Christmas is probably the most exciting time of the year for many children. You can add to that joyfulness by designing a set of kids binoculars that reminds the young ones of Santa Claus. See the photo above. Dress up a pair of toilet paper tubes in red and white so they look something like Santa’s suit. You can read the details of one way to do so at Meri Cherry. Another holiday that lends itself to decoration is St. Patrick’s Day. Green is the color of the day, and shamrocks are its symbol. Add some green or a full rainbow of colors and a four-leaf clover to your toilet paper rolls to get your children into the spirit of the holiday. Glue Dots has directions for the rainbow style binoculars here. Since the sky is one of the things you often look at with your binoculars, why not decorate yours in sky blue paper and puffy clouds? Your children will love watching the constantly changing shapes in the heavens. You might even play the game with them where you look for clouds that remind you of other objects and shapes. See how to make cloud binoculars at Buggy and Buddy. Curvy black and white stripes make just about anything look like a zebra. You can have fun changing your toilet paper rolls into zebras as part of a zoo theme. Actually taking your child to the zoo would be a great field trip on which to use these binoculars. Imaging looking at a zebra through a pair of zebra binoculars! The Teaching Zoo will instruct you how to make these zoo binoculars. Sharks can be dangerous animals, but they’ll probably seem less so when you and your child turn toilet paper tubes into a pair of sharks. Complete with fins and sharp teeth, these binoculars are fun just to look at. Unfortunately, you won’t be able to use them in the water. See directions for construction here at Pink Stripey Socks. 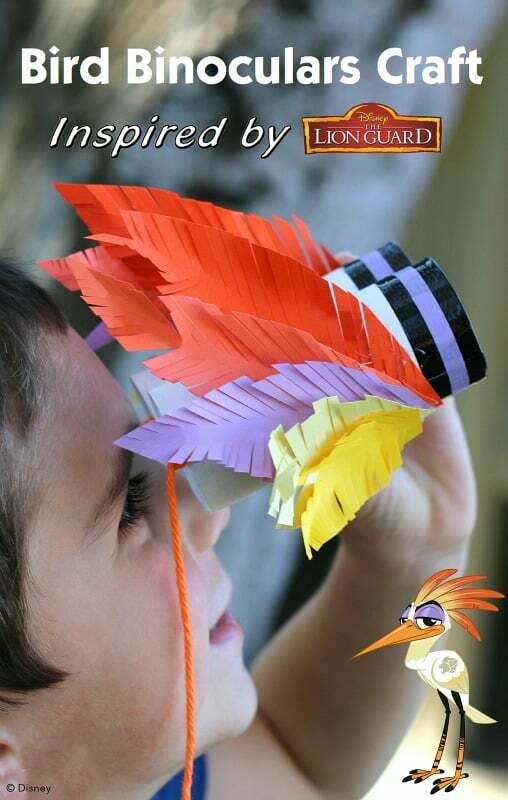 Adding some brightly colored feathers to your homemade binoculars turns them into exotic birds. Make them a toucan or a canary or a wild African bird. You can make the tubes symmetrical by adding the same feathers on each side or make them seem like two different birds – one in each hand. Buggy and Buddy are the source for these binoculars too right here. The ideas above are just a start for crafting kids binoculars. Use your imagination, or better still, you kids’ imaginations, to design more binoculars with fun themes. If you come up with something unique, why not share it with us here? We’d love to see what you made. 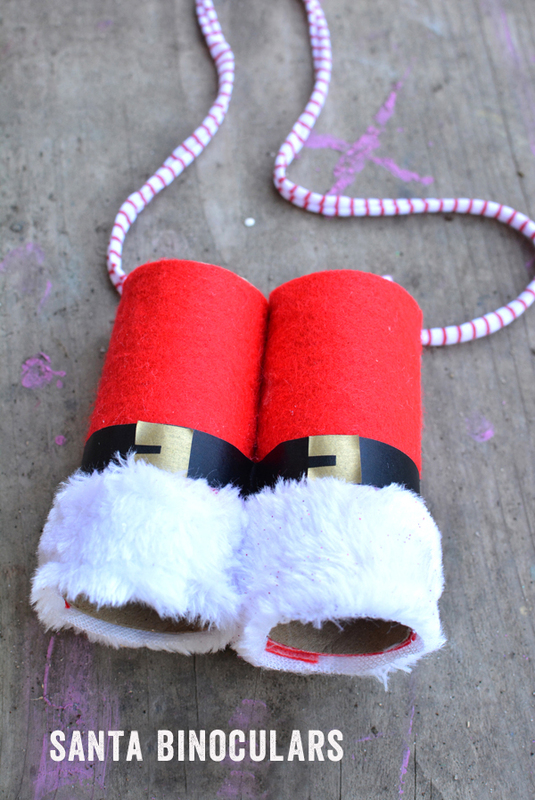 UPDATE: Here’s a bonus 7th binoculars craft I just found on Maggy’s site at Red Ted Art. I’m just going to drop the link to her post here. You can check out the details by visiting that site.